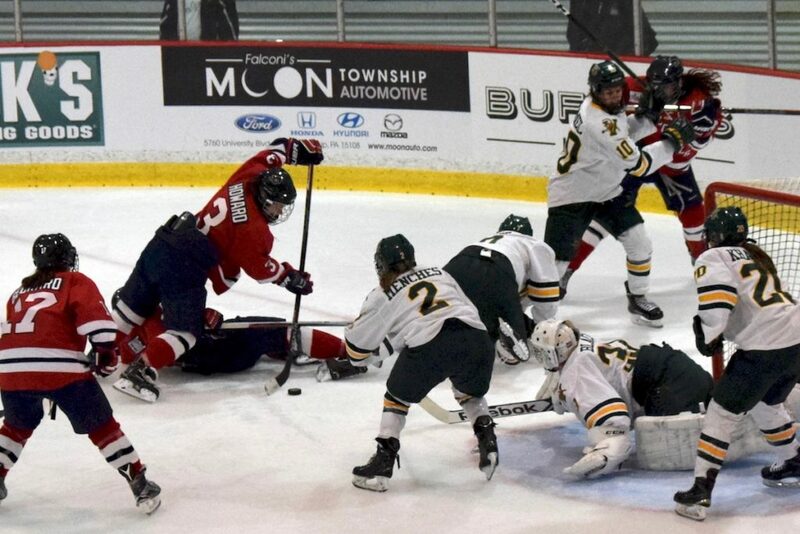 NEVILLE TWP.– Last week, the Robert Morris Women’s Hockey team opened their home schedule with an inspiring win on Friday against the RPI Engineers. They followed it up with a lackluster start to their Saturday game and had to settle with a win and a tie in their two-game set. This Friday had the same feel for the Colonials, who led the majority of the game on their way to a win against the Vermont Catamounts. This Saturday saw the same results from as week before. A 2-2 tie at 84 Lumber Arena pushed the Colonials to 4-0-2 to open the season. However, this game had a different feel than what we saw a week before. The way that the Colonials came out and flashed dominance for the majority of their game could speak to the growth and upside which may come from this team as the season grinds on. Robert Morris jumped out to an early lead thanks to — you guessed it — the line of Amber Rennie, Brittany Howard, and Jaycee Gebhard. The Colonials outshot Vermont, 35-15 and the puck was seemingly in their end of the ice from start to finish. While the stat sheet is not the final verdict when it comes to wins and losses, the Colonials showed that they have what it takes to play consistently for two straight nights, and overall looked like the better team all weekend. The Colonials are still undefeated through six games. With the talent on this roster, they could be a team making a run as they head closer to spring. This tie could be used as a learning moment, and a bridge to get over the hump of finishing teams off, something they will have to do when the games get more important. Maturing and finishing should and will be the talk of the week for the Colonials, who succumbed a 2-1 lead with just 4:45 to go in the game. “We definitely want to finish our last ten percent. Coach always says that the last ten percent is the hardest and we definitely need to work on that going into next week,” added Howard. From their tie with RPI to their tie with Vermont, this team did already show signs of growth. The Colonials will have their chance to show that they are improving every week, and prove that they are able to finish as they head to the road next weekend to take on the Merrimack Warriors. With conference play just two weeks away, this will be a great chance to find a groove and enter the conference season as a better and more mature team than the one that opened the regular season.